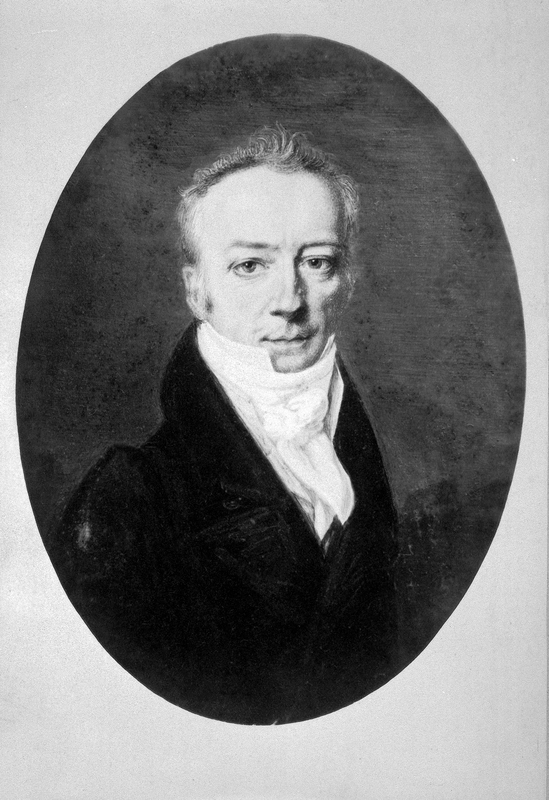 James Smithson (c. 1765–June 27, 1829), scientist and philanthropist, was born James Louis Macie in Paris, where his mother gave birth to him in secret. His father, Hugh Smithson, was the first Duke of Northumberland and one of the great patrons of the 18th century. His mother, Elizabeth Hungerford Keate Macie, was a wealthy widow from Weston, England, and a cousin of the Duke’s wife. James Louis Macie entered Pembroke College, Oxford, in 1782, where he excelled in chemistry and mineralogy. While still attending college, he managed to join the prominent French geologist Barthélemy Faujas de St. Fond on his tour of Scotland, with a group of distinguished scientists. Faujas published an account of their trip in 1797. In 1786, Macie received a master’s degree from Pembroke College. He moved to London and immersed himself in the rich culture of the city, joining several scientific clubs and keeping abreast of the latest scientific controversies and discoveries. His field, chemistry, was the most exciting and cutting-edge field of the day, one that lay at the heart of the making of modern industrial society. Within a year, he was admitted to the Royal Society (Britain’s oldest and most prestigious scientific society) as its then youngest member. Macie presented his first paper, “An Account of Some Chemical Experiments on Tabasheer,” to the society July 7, 1791, recounting his chemical analyses of this intriguing substance occasionally found in the hollow of bamboo canes. In 1792, Macie traveled to Europe. His grand tour was not like that of other young aristocratic gentlemen in that he was interested primarily in meeting the great scientists of Europe. He traveled first to Paris and, in thrall to the French Revolution, which he saw as “consolidating the throne of justice and reason,” stayed there for nearly a year. He remained abroad until 1797, spending extended periods of time in Switzerland, Italy and Germany, where he greatly augmented his mineral collections. In London in 1800, Macie became a founding member of the new Royal Institution of Great Britain, an organization devoted to “diffusing the knowledge, and . . . teaching . . . the application of science to the common purposes of life.” This also was the year that his mother died. She left her estate to her eldest son, with directions to support his brother, Henry Louis Dickinson, who was then abroad with the British Army. Within a month of his mother’s death, Macie changed his surname to Smithson. At the conclusion of the Napoleonic Wars, Smithson moved to Paris, where he lived most of the rest of his life. He enjoyed the company of many outstanding scientists, including the astronomer Dominique François Arago; the founder of comparative anatomy Georges Cuvier; the French chemist Claude Berthollet, who led the scientists on Napoleon’s expedition to Egypt in 1798; the Swedish chemist Jons Jakob Berzelius; the Dane Hans-Christian Oersted, discoverer of electro-magnetism; and the famed explorer Alexander von Humboldt. In Paris, Smithson wrote 17 of his 27 known papers, publications that ranged from mineral analyses and identifications to improvements to the blowpipe and other apparatus, as well as a treatise on a better method for making coffee. His most important paper, “A Chemical Analysis of Some Calamines,” led the French mineralogist François Beudant to name the mineral zinc carbonate “smithsonite” in 1832, a few years after Smithson’s death. Smithson died in 1829, at approximately 64 years old, while living in Genoa, Italy, and was buried in the English Protestant cemetery. His will was printed in the Times of London, and the exceptional potential windfall for the United States caught the eye of an American editor and was reprinted in The New York American. Hungerford, Smithson’s nephew and heir, was only in his early 20s, and it seemed unlikely that this clause would ever go into effect. Six years later, June 5, 1835, Hungerford died of unknown causes in Pisa, Italy, leaving no heirs. The United States government was soon notified of this extraordinary bequest, and President Andrew Jackson announced the news to the U.S. Congress. After heated debate as to whether the federal government had the authority to accept the gift, Congress accepted the legacy bequeathed to the nation and pledged the faith of the United States to the charitable trust July 1, 1836. The estate, valued at more than $500,000, was awarded to the United States May 9, 1838. For the next eight years, Congress debated what to do with the estate—establish a university, astronomical observatory, scientific research laboratory, museum or library? It was finally President James K. Polk who signed the legislation Aug. 10, 1846, establishing the Smithsonian Institution. Since its founding more than 160 years ago, the Smithsonian has become the world’s largest museum and research complex, with 19 museums and numerous research facilities. In 1865, only a decade after the completion of the Smithsonian’s first building, the “Castle,” the top floor of the building was destroyed in a terrible fire, and among the losses were Smithson’s diaries and papers, his mineral collection and other personal possessions. His library, which was stored in a different part of the building, survived. In later years, the Institution acquired Smithson’s remains as well as ephemera related to its founder. In 1903, the cemetery in Genoa, Italy, where Smithson was buried was displaced by the enlargement of a quarry. Alexander Graham Bell, a regent of the Smithsonian, personally escorted Smithson’s remains from Italy. Smithson’s coffin was greeted on American shores by a troop of U.S. Cavalry and the Marine band. His remains were reinterred in the original Smithsonian Institution building (the “Castle”). The motives behind Smithson’s bequest, which has had such a significant impact on the arts, humanities and sciences in the United States, remain a mystery. He never traveled to the United States and seems to have had no correspondence with anyone in the country. Some have suggested that his bequest was motivated, in part, by revenge against the rigidities of British society, which had denied Smithson, who was illegitimate, the right to use his father’s name. Others have suggested it reflected his interest in the Enlightenment ideals of democracy and universal education. Photograph of a portrait of James Smithson (1765-1829), founding donor of the Smithsonian Institution, as an adult. The photograph is of a miniature portrait of Smithson done in oil on ivory by Henri Johns on May 11, 1816 at Aix la Chapelle, France.